Terry McAuliffe, the Democratic candidate for Virginia governor, mostly avoided energy policy in a speech at a Thursday event on energy policy, signaling to his critics that he would rather not discuss his own record in that area. The forum, hosted by the Consumer Energy Alliance, was designed to inform Virginians on "the two [Virginia gubernatorial] candidates' plans for ensuring access to affordable, reliable energy." McAuliffe spent less than a minute of his 18-minute speech discussing energy policy. He did not detail specific policy proposals in his prepared remarks, only stressing the importance of technological innovation and citing carbon sequestration and solar power as examples. The rest of the speech was devoted to other issues. He spent about four and a half minutes discussing "social" issues and what he called the "rigid ideological agenda" of his Republican opponent, Virginia attorney general Ken Cuccinelli. McAuliffe devoted another three and a half minutes to education. He also touched on transportation, health care, budget issues, and business and entrepreneurship generally. Cuccinelli’s campaign said McAuliffe steered clear of energy issues in order to avoid discussing his record in that area. "Terry McAuliffe offered no explanation for saying that he never wants another coal plant built, did not address his election year flip-flop on offshore energy, and dodged an opportunity to address President Obama’s job-killing War On Coal," the Cuccinnelli campaign said in a statement on the forum. 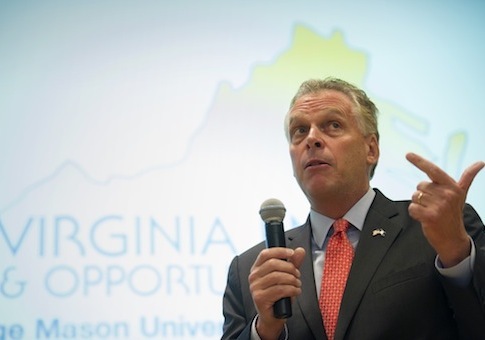 McAuliffe’s reversals on high-profile energy policy positions have come under scrutiny throughout the campaign. McAuliffe said during his unsuccessful 2009 run for governor he "never want[ed] another coal plant built" in Virginia. He also opposed offshore oil exploration, saying, "I do not support drilling for oil off our coast." He has since reversed his positions on both of those issues, earning rebukes from political fact-checkers. The reversals have paid dividends for his campaign. After changing his positions on coal power and offshore drilling, McAuliffe attended a fundraiser at the home of a high-profile lobbyist for the oil and coal industries. Asked about those reversals in a Q&A with reporters after the forum, McAuliffe attacked Cuccinelli for suing the University of Virginia over allegations of fraud involving a high-profile climate activist who taught at the university. "Also absent from his opening" at Thursday’s forum, noted Cuccinelli spokesman Richard Cullen, "was any mention of two companies he started that used to be a mainstay of his campaign pitch: GreenTech and Franklin Pellets." GreenTech and Franklin are two McAuliffe business ventures that have faced financial difficulties. The latter, a planned venture to produce biomass power, has yet to manufacture any of the wood pellets used in the process. GreenTech Automotive has received significantly more attention due to the high-profile political figures backing it and the recent announcement of a Securities and Exchange Commission investigation into the company. Asked about GreenTech, which is headquartered in McLean, Va., but so far has only produced vehicles at its production facilities in China, McAuliffe downplayed concerns over the company’s financial difficulties. As an entrepreneur, McAuliffe said, "you hope for the best, but things sometimes take more. … That’s all part of the business cycle and the ups and downs of the business cycle." This entry was posted in Politics and tagged Cronyism, GreenTech, Ken Cuccinelli, Progressive Movement, Terry McAuliffe. Bookmark the permalink.